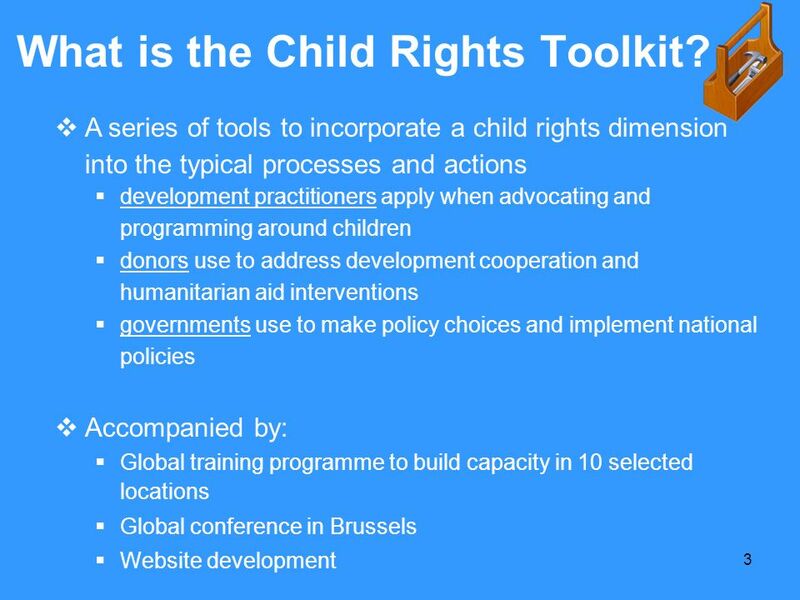 3 What is the Child Rights Toolkit? 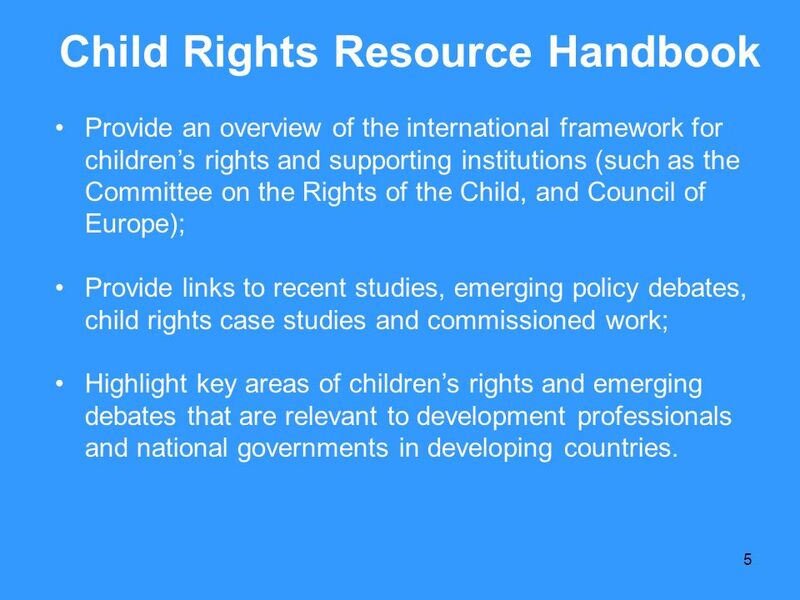 Provide an overview of the international framework for children’s rights and supporting institutions (such as the Committee on the Rights of the Child, and Council of Europe); Provide links to recent studies, emerging policy debates, child rights case studies and commissioned work; Highlight key areas of children’s rights and emerging debates that are relevant to development professionals and national governments in developing countries. 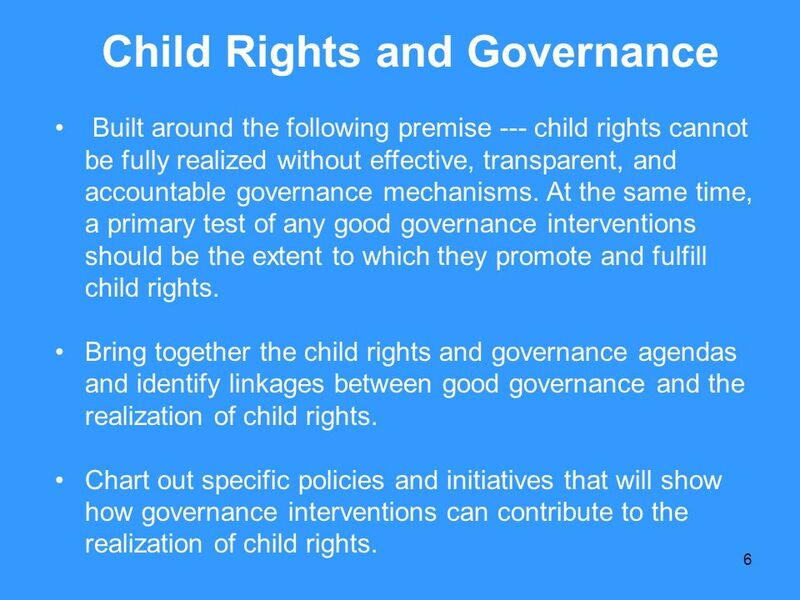 Built around the following premise --- child rights cannot be fully realized without effective, transparent, and accountable governance mechanisms. At the same time, a primary test of any good governance interventions should be the extent to which they promote and fulfill child rights. Bring together the child rights and governance agendas and identify linkages between good governance and the realization of child rights. Chart out specific policies and initiatives that will show how governance interventions can contribute to the realization of child rights. 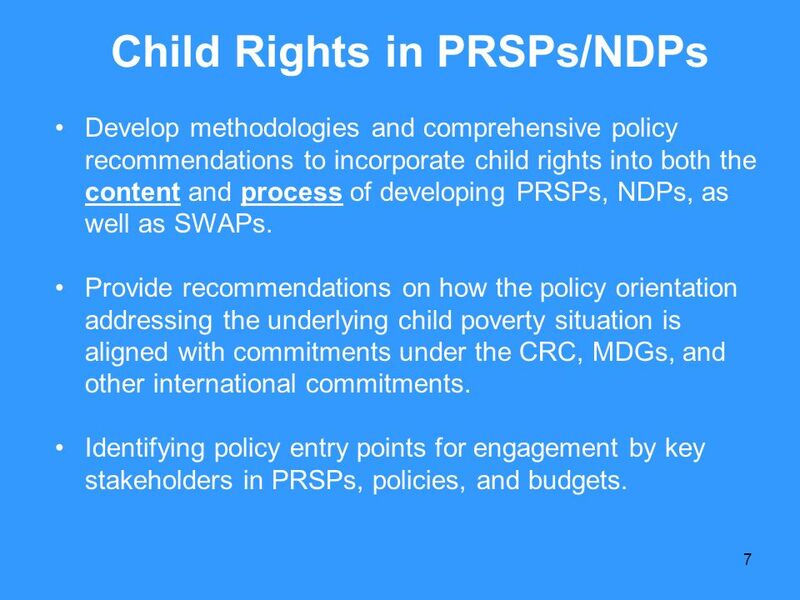 Develop methodologies and comprehensive policy recommendations to incorporate child rights into both the content and process of developing PRSPs, NDPs, as well as SWAPs. Provide recommendations on how the policy orientation addressing the underlying child poverty situation is aligned with commitments under the CRC, MDGs, and other international commitments. Identifying policy entry points for engagement by key stakeholders in PRSPs, policies, and budgets. 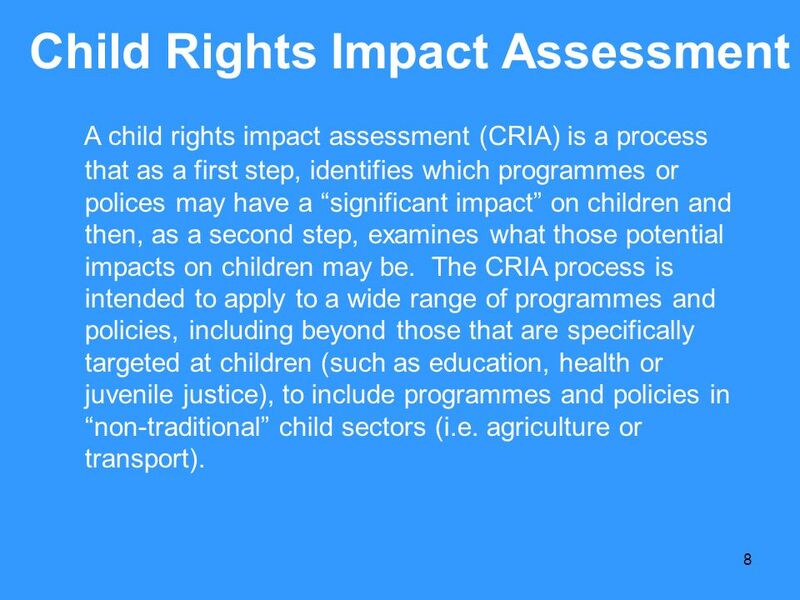 A child rights impact assessment (CRIA) is a process that as a first step, identifies which programmes or polices may have a “significant impact” on children and then, as a second step, examines what those potential impacts on children may be. The CRIA process is intended to apply to a wide range of programmes and policies, including beyond those that are specifically targeted at children (such as education, health or juvenile justice), to include programmes and policies in “non-traditional” child sectors (i.e. agriculture or transport). Identifies and develops ways to systematically assess the impacts of budgetary allocation and leveraging a larger proportion of the national budget for implementation of the CRC. 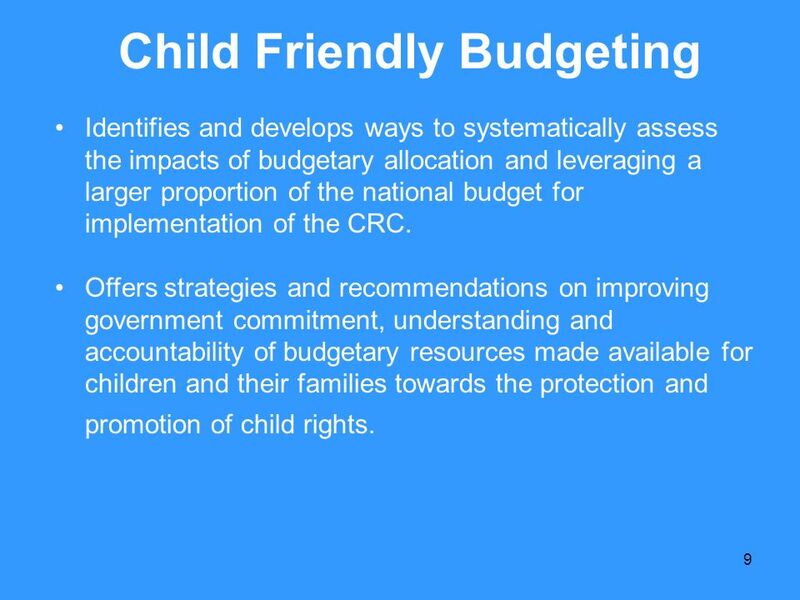 Offers strategies and recommendations on improving government commitment, understanding and accountability of budgetary resources made available for children and their families towards the protection and promotion of child rights. Provides guidance on addressing child rights across a range of crisis situations, in conflict-affected fragile states and post-crisis transition – pulling together a coherent picture of key child rights issues in these circumstances. 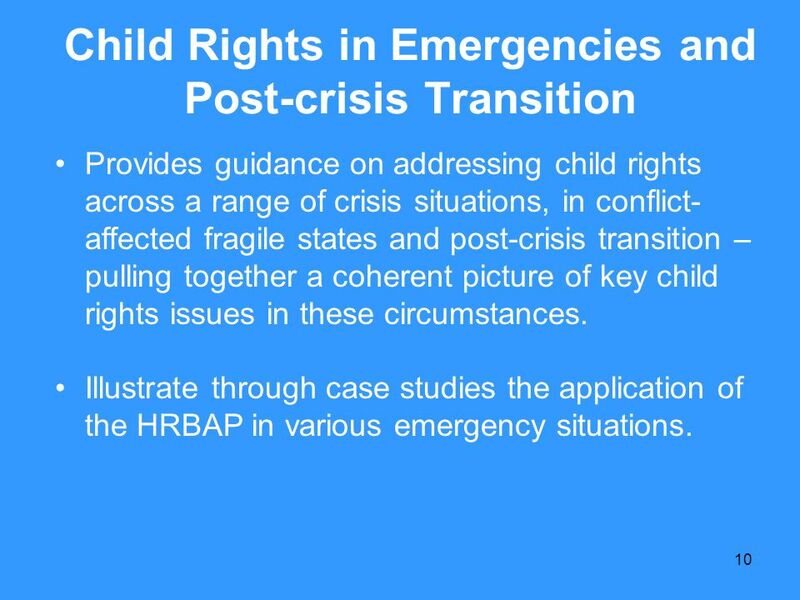 Illustrate through case studies the application of the HRBAP in various emergency situations. 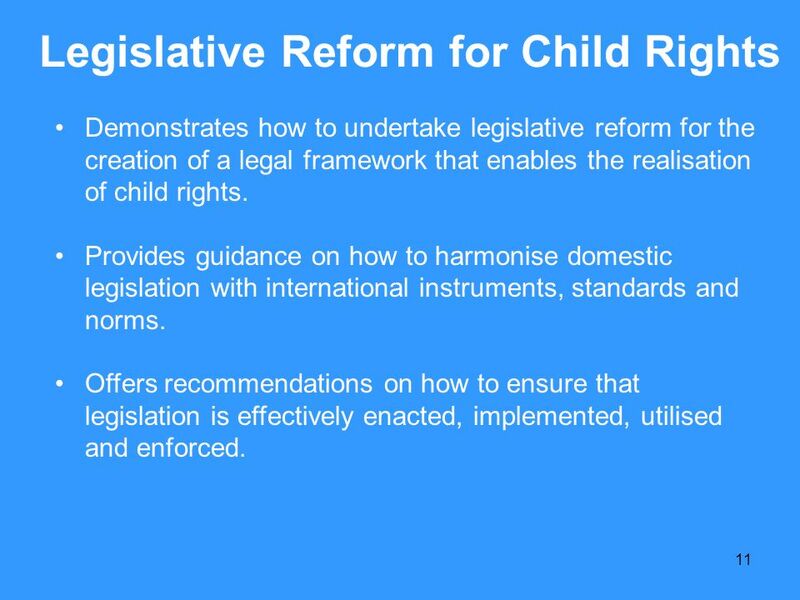 Demonstrates how to undertake legislative reform for the creation of a legal framework that enables the realisation of child rights. Provides guidance on how to harmonise domestic legislation with international instruments, standards and norms. Offers recommendations on how to ensure that legislation is effectively enacted, implemented, utilised and enforced. 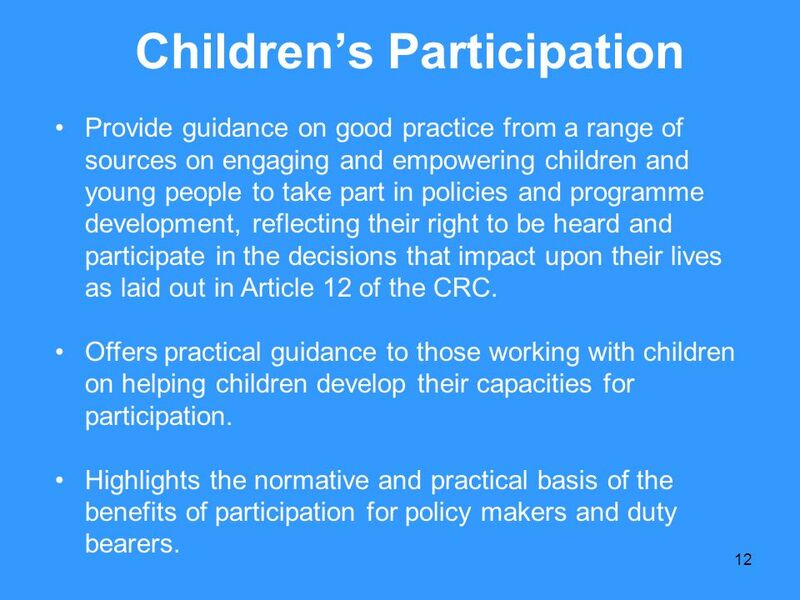 Provide guidance on good practice from a range of sources on engaging and empowering children and young people to take part in policies and programme development, reflecting their right to be heard and participate in the decisions that impact upon their lives as laid out in Article 12 of the CRC. Offers practical guidance to those working with children on helping children develop their capacities for participation. Highlights the normative and practical basis of the benefits of participation for policy makers and duty bearers. 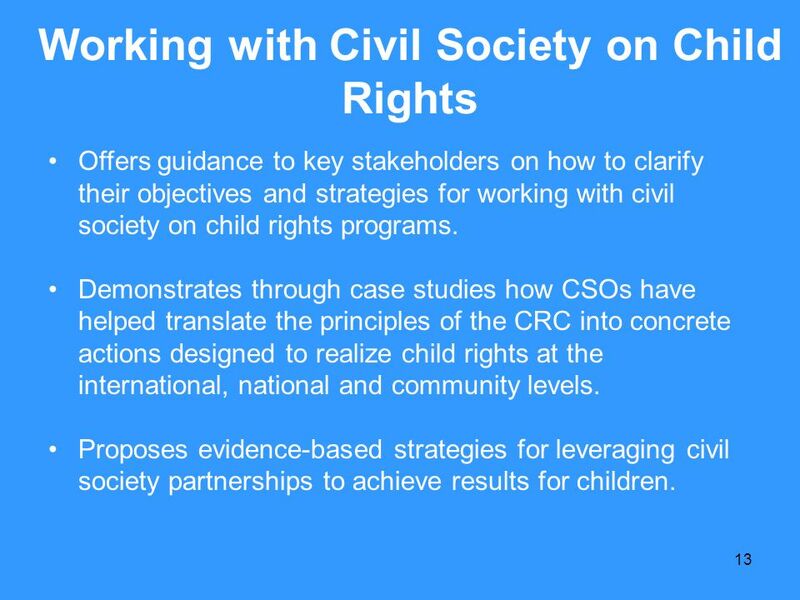 Offers guidance to key stakeholders on how to clarify their objectives and strategies for working with civil society on child rights programs. 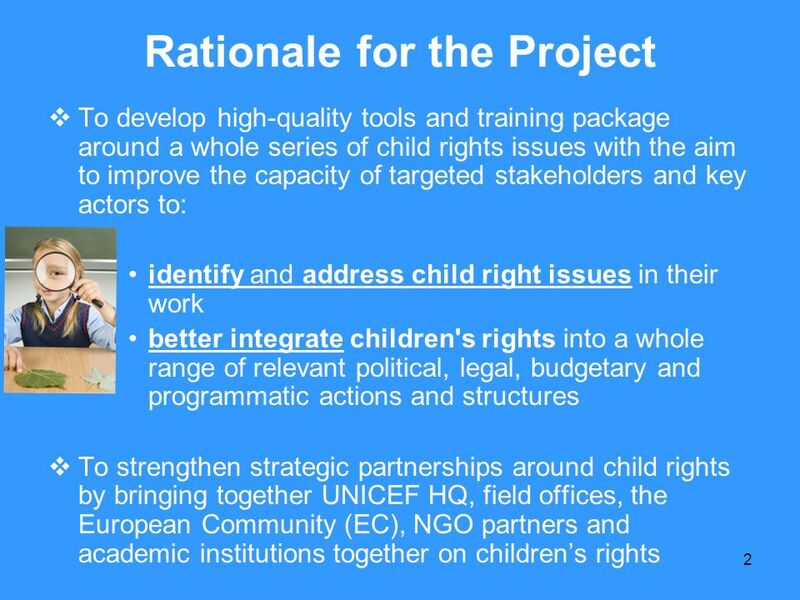 Demonstrates through case studies how CSOs have helped translate the principles of the CRC into concrete actions designed to realize child rights at the international, national and community levels. 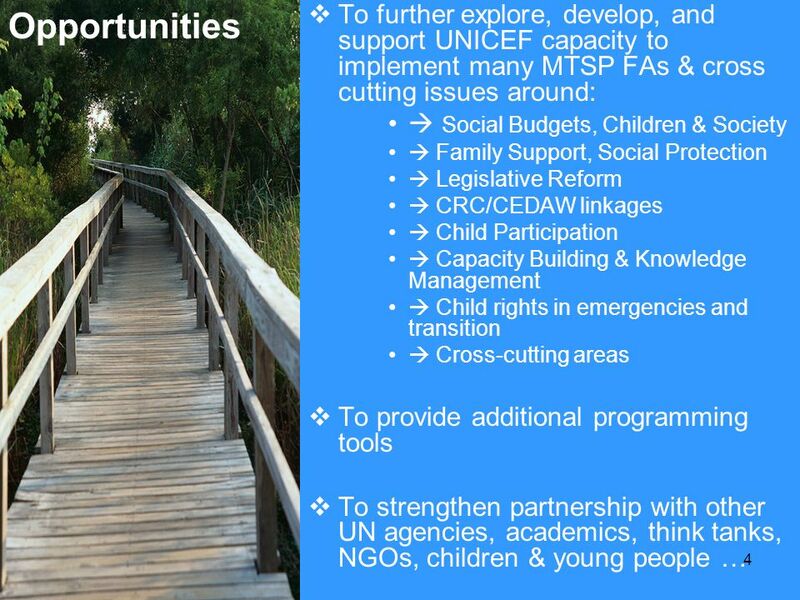 Proposes evidence-based strategies for leveraging civil society partnerships to achieve results for children. 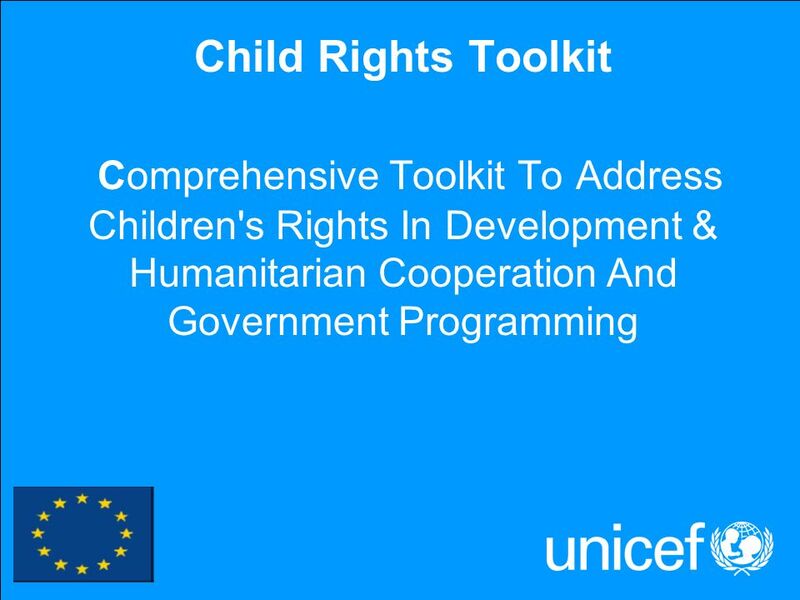 Download ppt "Child Rights Toolkit Comprehensive Toolkit To Address Children's Rights In Development & Humanitarian Cooperation And Government Programming." Mainstreaming Disability in the Development Agenda. U N Commission for Social Development 12 February, Charlotte McClain-Nhlapo Senior Operations. Dr. Stuart Kean Co-Chair UK OVC Working Group Moving Upstream with Children HIV and AIDS Integrating CABA into national development instruments Inter-Agency. Development and Cooperation Preparing the Communication on Civil Society Organisations in Development. Neighborhood Civil Society Facility Regional Seminar Brussels, 9 and 10 February 2012 ENGAGING STRATEGICALLY WITH CIVIL SOCIETY IN THE EUROPEAN NEIGHBOURHOOD. EuropeAid ENGAGING STRATEGICALLY WITH NON-STATE ACTORS IN NEW AID MODALITIES SESSION 1 Why this Focus on Non-State Actors in Budget Support and SPSPs?